Includes breakfast, snacks mid stream, and a BBQ with beers & sodas on our adventure island. The grade 3 offers a Milder experience of the Nile, compared to our popular grade 5 option, and . Choose to paddle as part of a team or opt for a softer option and be rowed downstream by our professional guides in the safety raft. We can take kids younger than 16 under the following conditions. 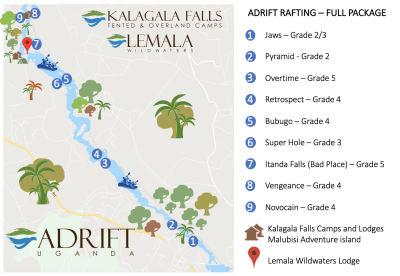 They must fit into an adult life jacket | They are aware that there is a compulsory walk around two rapids | They will do a Grade 3 trip, where they either run in the safety raft or in a paddle boat that will run the rapids, but do conservative lines | All children will be vetted by the Trip Leader or Ops Manager on the morning of the trip to make sure they know what they are in for. This is still a really fun trip, as they run alongside the Grade 5 trip and enjoy all the action, but for Adrift safety is of paramount importance to us and the youngsters are not an exception to this.